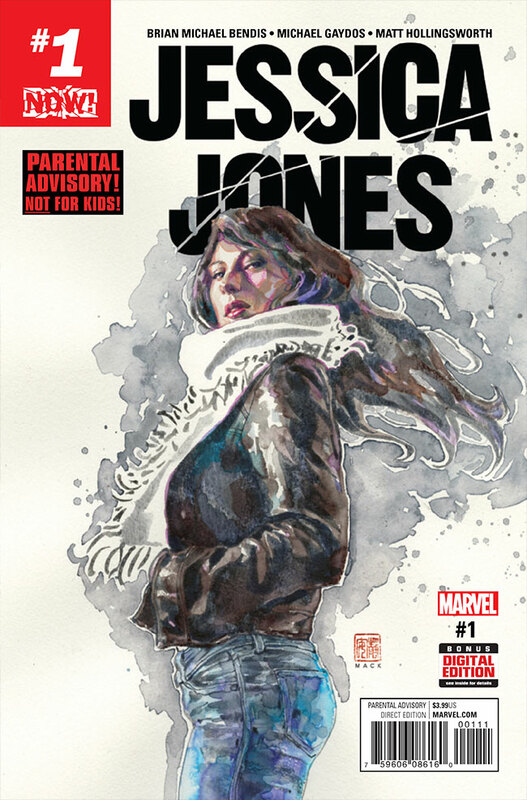 Say what you like, Jessica Jones is a character who is at her most compelling when beleaguered, set upon and troubled. Alias revelled in seeing her overcome great odds and her own actions and although her appearances since her own title had her finding some semblance of peace and happiness it’s clear that on returning and picking up her story after over a decade away, Bendis isn’t interested in a happy Jessica either. With original artist Gaydos back on board as well we find our reluctant heroine, with a few tweaks here and there, pretty much back where they left her all those years ago. This issue finds her fresh out of prison and stubbornly dodging questions about the mysteries mounting up in her own life, her marriage, her time in prison and most importantly what, if anything, has happened to her daughter Danielle. Barely skipping a beat, Bendis drops us back into her world-weary frame of mind as if we were picking up the story from last month, never mind over a decade ago. His characters’ voices are all distinct and sharp, never more so than when they are giving a knowing wink to the changes in the Marvel landscape since Alias wrapped up. Although it’s comforting to once again to hear Jones’ jaded inner monologue, this time we can most definitely see where it might trip her up. Over the years she’s tussled with superheroes and seen incredible things, but when her new client mentions her husband’s unusual behaviour and outlandish claims of having lived another life, starting “eight months ago”, dismissing the obvious answer and leaving us on the edge of our seats as Bendis teases us with a mystery of a character who is either on the con, or an unwitting casualty caught up on the wrong end of Hickman’s recent cosmic reshuffling. Reminiscent in part of the classic Astro Cities storyline, “The Nearness Of You”, with average citizens caught up in universe altering events they can scarcely comprehend, let alone react against, it sets up one of the books many, many mysteries. Gaydos’ art for the first issue is as despondent and melancholy as it ever was. His tired and worn out characters set against his un-superheroic, washed-out New York City managing to feel both fresh and familiar, emphasising just how unusual his style and tone is to comics even on the second time around. It’s thrilling to see the recently formed Champions striding through New York in Gaydos’ gorgeously grimy and downbeat style as Jessica sits and look on, suitably nonchalant at the public posturing and heroic antics around her. You can find more of Jason’s comicbook musings on his own blog by CLICKING HERE.